Islington 1984 by Dave Bangs. Blundells Pansmastic. A commemoration of a local event and a local person. In the back streets of Kings Cross, heading towards Angel Islington , there is a little green space called Edward Square, a piece of land which has been fought for by the locals who stopped it being developed into property and offices. This space has play areas and various pieces of recent public art including a mural dating back to 1984. 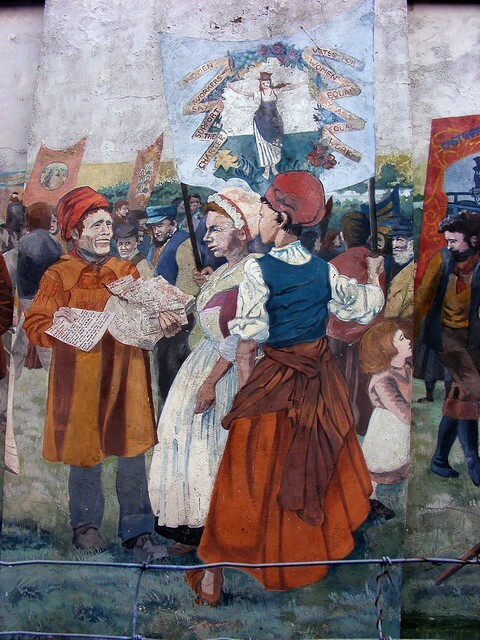 This mural shows a piece of local history: the gathering of people organised by the Central Committee of the Metropolitan Trade Unions to march between Copenhagen Fields, an area local to Kings Cross, to demonstrate against the transportation to Australia of early trade unionists who became known as the Tolpuddle Martyrs (which is also the name of the mural). This painting was developed by artist Dave Bangs who has a strong interest in the trade unions. The mural was part of Operation Clean up Islington run through Community Service Volunteers (CSV). Local residents supported the idea of a mural as they thought it would complement the new park and so it was to be painted on the side of a pub called the Mitre in Copenhagen Street which overlooks the square. CSV sorted out getting the wall rendered, an important part of preparing the wall and creating longevity of the mural. Scaffolding was set up and Dave began his work, using a paint called Blundell’s panmastic. The mural is an unusual shape: an upside down ‘T’. The paintings composition cleverly fits the shape; a scene of colourful marchers waving union banners is in the T-bar section of the mural whilst to fill the space of the high section (the gable wall of the pub), a tall tree has been painted. This creates a strong unity of composition without making that section look odd or stand out. According to a newspaper article, Dave Bangs is quoted as saying “It took me two seasons to complete,” he said. “And I’ve always felt it was one of my best works.” In a telephone conversation, he also reiterated how he felt that piece was the first one where everything came together – his 'apprenticeship piece'. The mural was officially opened in 1984 by socialist farmer, Isaac Evans, who explained Socialism to the local children. A small festival was also held which included a play about the Topuddle Martyrs. Since this time, it has had its fair share of being covered up or threatened. In the 1990s, it was covered by an advertising hoarding. Lisa Pontecorvo who had been involved in the shaping of Edward Square, led the campaign to remove the hoarding and reveal the mural. She is commemorated in the mural and can be found holding the sign about the Tolpuddle Martyrs story located in the bottom right of the mural. This portrait was added by Karen Gregory after Lisa’s untimely death in 2008. Karen has also worked on regular restoring of small parts of the mural. Another threat to the mural was the closing of the pub and conversion to flats. The mural hasn’t been painted over so it’ll survive to see another day. It’s just a shame it is now obscured by newly planted trees. Perhaps one day it can get the protection it deserves so that more people will be able to learn about an important event that happened in the area. Cracks and paint peel. Graceful fading. Exit Kings Cross Station by the main exit on Euston Road; cross York Way then turn left to head north up Caledonian Road. Just past the bridge over the Regent's Canal, is the entrance to Edward Square. The mural is on the wall on your right as you turn left into Edward Square.